The Gibson name has stood for superior quality in musical instruments for decades now. With Gibson's Learn & Master Guitar, taught by guitar pro Steve Krenz, that tradition of excellence continues. 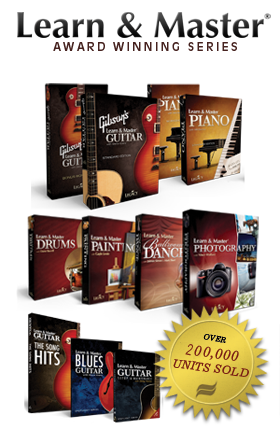 Gibson's Learn & Master Guitar course is known as the most complete course available for learning guitar. 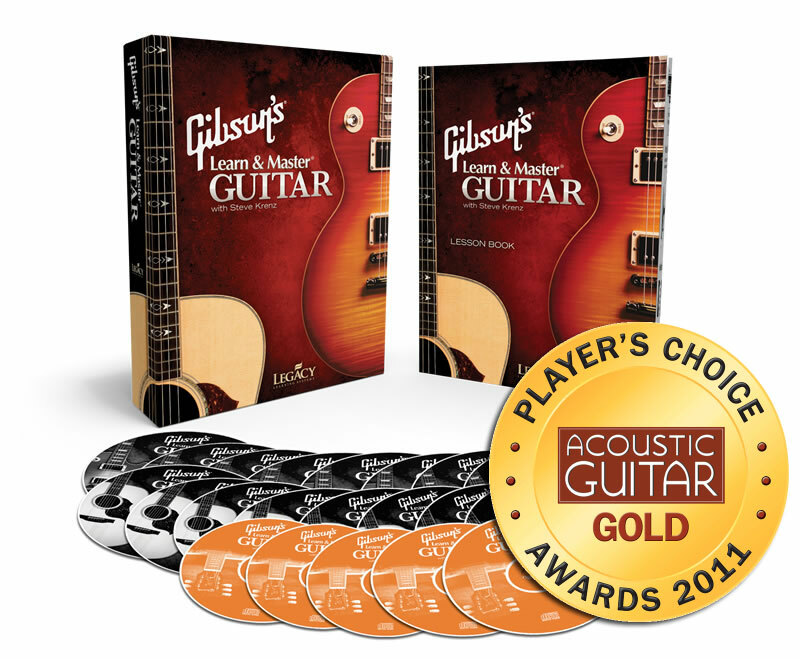 It is the winner of the Acoustic Guitar Magazine ‘Players' Choice’ GOLD Award, two Telly Awards, and an AEGIS Award for Excellence in Education. Gibson’s Learn & Master Guitar is designed for all skill levels. We provide the roadmap and you provide the practice! If you have looked online for guitar courses, you have probably seen a lot of thirty-minute "Learn Guitar Overnight" videos. Your instincts tell you that these will not work. For someone who really wants to learn to play guitar, Gibson's Learn & Master Guitar provides a series of video guitar lessons that will take you from any skill level, even a total novice, through to advanced levels. Not a beginner guitarist? That's OK. Skim through the basics and jump into the more advanced training. Learn more about using the course as an intermediate player..
Gibson's Learn & Master Guitar program solves all of these problems. We combine the best instructional tools for learning guitar in one course. Try it today! Over 40 hours of instruction on 20 DVDs produced in High Definition. These are the heart of Gibson's Learn & Master Guitar.Each lesson is clearly explained and demonstrated, so you know exactly what and how to practice. The videos were recently awarded two Telly awards for excellence in the categories of Education and Use of Music. Gibson's Learn and Master Guitar covers everything from the very basics through the most advanced techniques. There's no way we could list everything, but here are a few of the things you will learn—and master! "What type of guitar will I learn to play?" We all have our favorite styles of music, so it's only natural that you'd be most interested in playing what you like. Unlike most guitar training products, Gibson's Learn & Master Guitar is complete enough to offer advanced training in all of the most popular styles. You can learn them all or just the ones that interest you most. This is where the fun comes in! These five CDs allow you to "jam along" with an actual band, using the very same songs you'll be learning in your lessons. There's no better way to learn than by playing, and there's no way to play that's more fun than jamming with a band. You'll be amazed at how much more fun this makes your practice time! Your friends and family will be impressed, too, at how soon you'll be playing such amazing music! 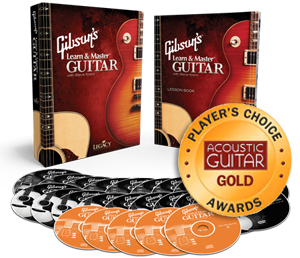 If you are an absolute beginner guitar player, Gibson's Learn and Master Guitar is designed so you can start at the very beginning and progress from there to each next new skill easily. You will feel comfortable with your guitar and your new-found ability before moving forward to more advanced levels. Our student support forum is a vibrant learning community with over 15,000 active users, all helping each other along as they progress through the course. Once you purchase the course, you will also get access to our Student Support and Community websites. Steve Krenz, the author of Gibson's Learn & Master Guitar, is online regularly, answering questions and offering encouragement, as are other students. You can also build a student profile, post recordings of your songs, track your progress, and get feedback from Steve and other students. 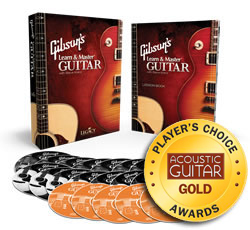 The Gibson's Learn & Master Guitar course has been awarded the Acoustic Guitar Player's Choice GOLD Award. Acoustic Guitar is both an online community of guitarists and a guitar magazine. Every two years, they hold their Player's Choice Awards. These awards are given to the best guitars, gear, and instructional products in the industry. We are proud to have received this prestigious recondition. We want you to be delighted with Gibson's Learn & Master Guitar. 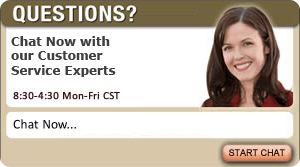 If you are not, simply return the course within sixty days for a full refund of the purchase price. No questions asked. It's that simple. We get very few returns, but when we do, they are handled promptly and courteously. Order now with confidence. Here are a few examples of the types of lessons that are included in the award winning guitar instructional series. No one wants to practice along with a video all of the time! Gibson's Learn & Master Guitar Lesson Book contains all of the songs and exercises demonstrated in the video lessons, as well as several more, so you can continue practicing at your own pace for as long as you need before moving on to the next lesson.